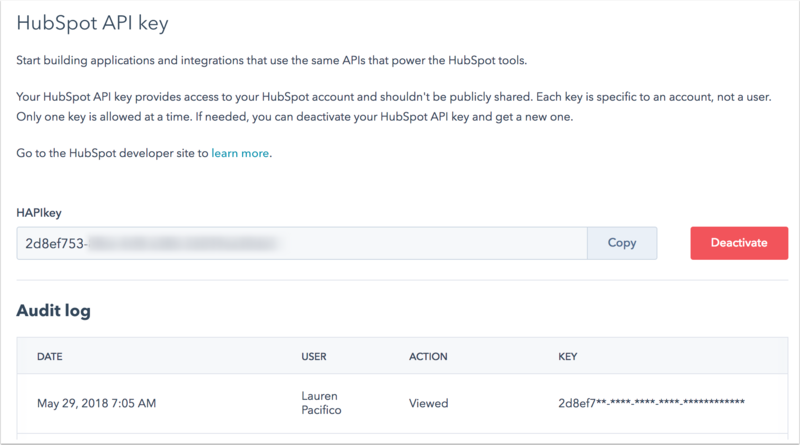 If you have admin access in your account, you can access your HubSpot API key in your integrations settings. In the left sidebar menu, navigate to Integrations > API key. If a key has never been generated for your account, click Generate API key. Once an API key has been created for your account, the key will appear here. Click Copy to copy the API key to your clipboard. To deactivate your current key, click Deactivate. You'll then be able to create a new key if needed. On this screen, you'll also see an audit log of users that have viewed, created, or deactivated an API key.